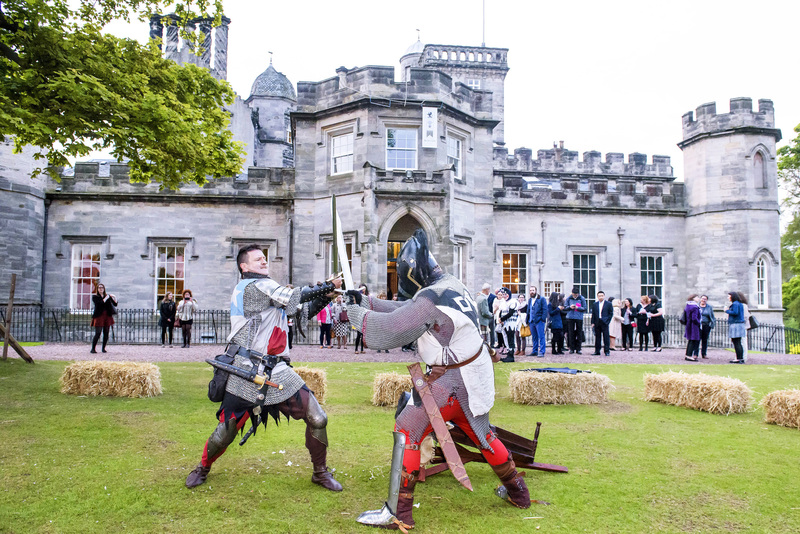 Winton Castle in East Lothian was chosen as one of three events venues by Spectra, the leading UK destination management company, for the biggest incentive event to come to Edinburgh this summer. 1400 US visitors experienced true ‘estate activities’ across three events venues, Hopetoun House, Dundas Castle and Winton Castle. Welcomed to Winton Castle by the skirl of the bagpipes, the American guests let their hair down in the gardens and grounds surrounding the Scottish Renaissance castle. 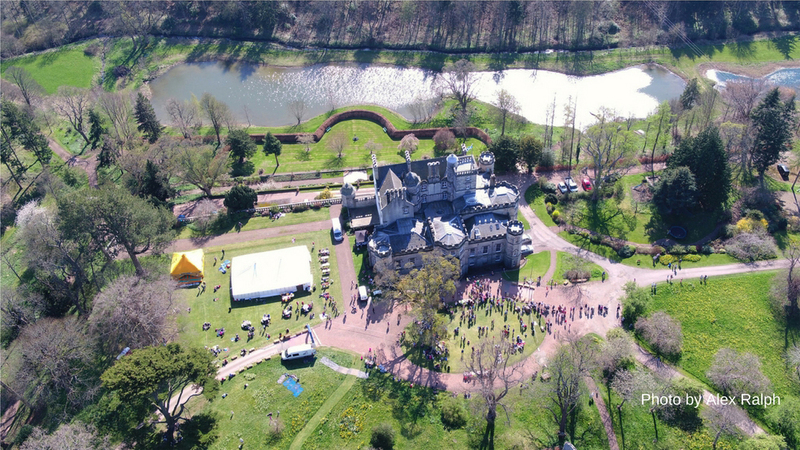 Around 250 top executives from an American insurance company had come to experience a morning of Scottish Estate Activities followed by a barbecue and hog roast. The visitors could try their hand at or enjoy watching clay pigeon shooting, air rifle target shooting, fly casting, archery, falconry, bush craft, men at arms and off-road 4 x 4 driving. “We were thrilled to be chosen to work with Spectra on such a big incentive event, bringing valuable business tourism to Edinburgh,” says Julie Britee from Winton Castle. “It was really important that the top executives could experience a great mix of Scottish estate activities without having to travel far out of Edinburgh – Winton Estate is just half an hour from the city centre. 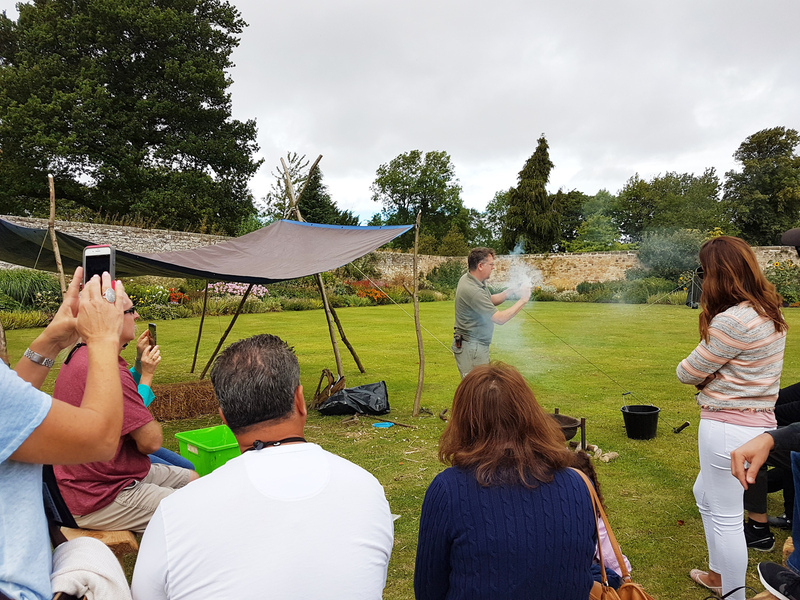 Winton’s beautiful walled garden was the scene for many of the activities including the medieval bush craft demonstrations, while the clay shooting with Billy Gordon, 24 times Scottish clay champion, took place out in the woods. The Landrover off-road driving was experienced on Winton’s 4 x 4 course, originally designed for the press launch of the highly successful Jeep Renegade. A barbecue and hog roast were served up on the croquet lawn for lunch, and bars revived participants with local brews from Edinburgh Gin, Knops Brewery and Innis & Gunn. Tours were laid on so that visitors could hear about the castle’s rich history and its connections to the powerful Seton family, Mary Queen of Scots, the Jacobites, Bonnie Prince Charlie, and the Elgin Marbles. Visitors had an opportunity to see the Scottish Renaissance embellishments like the elaborate plaster ceilings and carved, twisted chimneys, as well as the masterpieces hanging on the walls. Despite its age, the castle is beautifully cared for, reflecting that it is still the family home of Sir Francis and Lady Ogilvy and their four children.